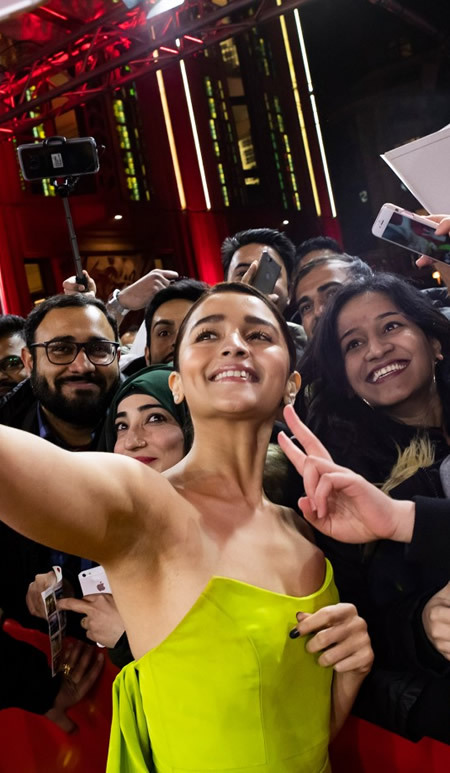 Photos: Indian actress Alia Bhatt at the Press Conference for the film ‘Gully Boy’ presented at the 69th Berlinale film festival on February 9, 2019, in Berlin, Germany. Images provided by Berlinale. Photo: Janina Uhse arrives in Audi e-Tron car for the “The Kindness Of Strangers” premiere during the 69th Berlinale International Film Festival at Berlinale Palace on February 7, 2019, in Berlin, Germany. (Photo by Franziska Krug/Getty Images for Audi AG). Copyright © 2019 Franziska Krug. Image provided by Audi AG. Photo: Tina Rexilius arrives in Audi e-Tron car for the “System Crasher” (Systemsprenger) premiere during the 69th Berlinale International Film Festival at Berlinale Palace on February 8, 2019, in Berlin, Germany. (Photo by Franziska Krug/Getty Images for Audi AG). Copyright © 2019 Franziska Krug. Image provided by Audi AG. Photo: Michael Beck and his daughters at the Audi Berlinale Brunch during the 69th Berlinale International Film Festival at Berlinale Palace on February 10, 2019, in Berlin, Germany. (Photo by Franziska Krug/Getty Images for Audi AG). Copyright © 2019 Franziska Krug. Image provided by Audi AG. Photo: Lisa-Marie Koroll at the Audi Berlinale Brunch during the 69th Berlinale International Film Festival at Berlinale Palace on February 10, 2019, in Berlin, Germany. (Photo by Franziska Krug/Getty Images for Audi AG). Copyright © 2019 Franziska Krug. Image provided by Audi AG. Berlin, February 8, 2019 — Mr. Matthijis Wouter Knol, Director European Film Market (EFM), inaugurated the India Pavilion at the Berlin International Film Festival (Berlinale) 2019. Ministry of Information & Broadcasting, in collaboration with Confederation of Indian Industry, is participating in the Berlin International Film Festival being held from 7th - 17th February 2019 at Berlin, Germany. An India Pavilion is set-up at the Festival to act as a platform to popularize Indian Cinema in the overseas market and facilitate new business opportunities. The Indian Delegation at Berlinale 2019 aims to promote Indian films across linguistic cultural and regional diversity to forge international partnerships in the realms of distribution, production, filming in India, script development and technology to accelerate the growth of film sector in India. The Delegation will also promote the Golden Jubilee edition of International Film Festival of India (IFFI) along with popularizing the steps taken to ease shooting films in India through Film Facilitation Office that facilitates Single Window Clearance for film-makers and provides the platform for ‘film tourism’ in India. To take advantage of the availability of technicians and skilled professionals, India will be showcased as a post-production hub to promote collaborations for films with international production houses. The Indian Delegation will meet officials from countries including Israel, New Zealand, France, Italy, China, Japan, Switzerland, Germany, Canada, the US, Greece, and the UK. The delegation will also meet with officials from Locarno Film Festival, EFM Director, Venice International Film Festival, New Zealand Film Commission, Cannes Film Festival, Edinburgh International Film Festival, and China Children’s Film Association, among others. Over 75 Indian film companies are participating at Berlinale 2019. 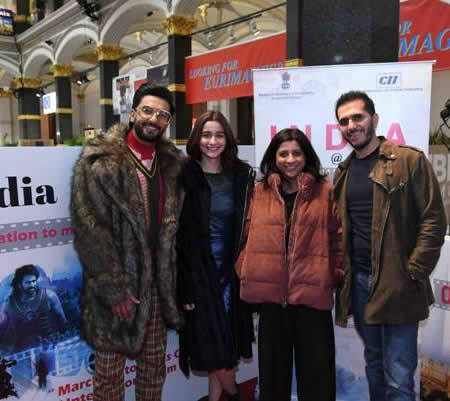 Meanwhile, the team behind the upcoming movie ‘Gully Boy’ including Mr. Ranveer Singh, Ms. Alia Bhatt, Ms. Zoya Akhtar, and Mr. Ritesh Sidhwani visited the India Pavilion. Berlinale - Berlin International Film Festival. Press conference highlights for #GullyBoy with the director and screenwriter Zoya Akhtar, actors Ranveer Singh @RanveerOfficial and Alia Bhatt @aliaa08 and the producer Ritesh Sidhwani @ritesh_sid.